This report allows you to assess storage costs for the backup infrastructure and to track the consumption of storage by backup files. The report estimates storage resources required to store backups. The cost can be calculated based on the price of 1 GB or TB of consumed storage space or on the price of a single VM. If there is a repository that is more expensive than other ones, an administrator can also specify the price adjustment factor (or the multiplier) that characterizes the premium charged for access to the repository. The report provides details on every backup job included into the report scope — the number of backed up VMs, size of a restore point and total amount of gigabytes transferred to the storage. This report allows managed storage providers (MSP) to generate billing statements for customers and to charge them for the used storage. The report can help administrators evaluate efficiency of the storage resources utilization. Scope: defines a list of backup repositories to analyze in the report. Job Type: defines a job type that should be evaluated (backup, backup copy or both). Backup Job: defines a list of backup and backup copy jobs to include in the report. Interval/Start date - End date: defines the interval for which the billing statement is required. 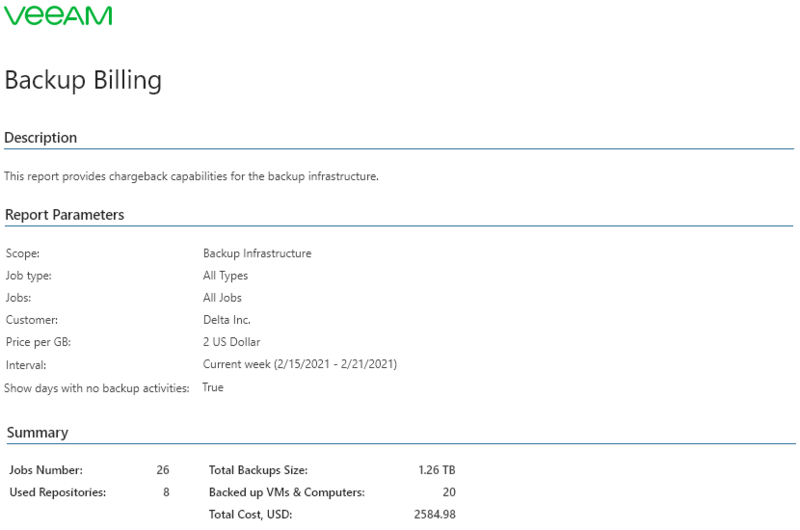 Price: defines a storage price for accommodating 1 GB/TB of backup files or a price for a single VM included in backup. Customer: defines customer name to display in the report output. Billing Parameters - Repositories: defines the price adjustment factor that characterizes the benefit (and the expense) of using the preferred repository storage. The resulting cost is calculated by multiplying the basic rate by the repository multiplier. This parameter is located in the Actions pane under the Billing Parameters section.